For twins, zygosity refers to the degree of genetic similarity within each pair. 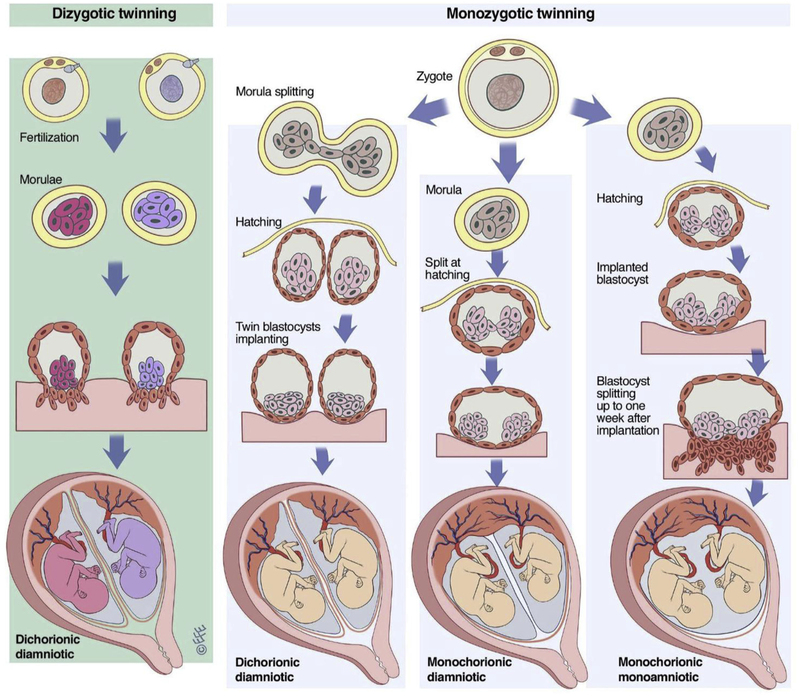 Monozygotic (MZ, identical) twins develop when one egg is fertilised by a single sperm and during the first two weeks after conception, the developing embryo splits into two. As a result, two, genetically identical babies develop. Chorionicity is the number of placentae of a pregnancy. This is most accurately determined between weeks 6 and 9 of gestation, sometimes up to week 12. At this time, a thick membrane (two chorions and two amnions) is clearly visible at ultrasound, separating dichorionic twins, which joins the placenta to form a lambda shape. In monochorionic twins, this membrane (two amnions only) is much thinner and joins the placenta to form a “T” shape. Ultrasounds taken later in gestations are less reliable due to the increased crowding of twins in the uterus. Physical examination of the inter-twin membranes at birth should also be used to determine chorionicity. This will provide confirmation of early ultrasound data and to determination of chorionicity in twins without early ultrasounds information. Dichorionic membranes are thick, opaque and can be pulled apart, whereas monochorionic membranes are thin and semi-transparent. Our studies have found that parents or twins who were incorrect in their assumptions of zygosity were incorrect because of wrong advice by parents or medical professionals, or by their own incorrect assumptions (Cutler et al. 2015). Self-report: Upon registration twins or their parents are asked what their zygosity is and how they know this information i.e. doctor, DNA test, their parents told them, or they can tell by the way they look. DNA zygosity test (see below): If the twins have a DNA zygosity test we will update the twins’ membership information with the results. Twin pairs who have conflicting zygosity reports or don’t know their zygosity are classified as unknown. Zygosity questionnaires have been developed to determine the zygosity of a pair of twins based on their overall similarity (“as alike as two peas in a pod”) and how often they are confused by other people. The most accurate method of determining zygosity is with a DNA zygosity test using the DNA probe method. The first step is to collect small amounts of DNA from inside each twin's mouth using a buccal swab (similar to a cotton bud). The sample contains cells, and most of the cells in our body contain a full set of genetic information in the form of DNA. A person's DNA represents a "genetic blueprint" and like a fingerprint, is unique to each individual. At the laboratory, the DNA is extracted from the cell and 12 specific regions of the DNA are amplified by a process known as PCR (polymerase chain reaction) for careful examination. The DNA patterns of the twins are compared to conclusively determine whether the twins are identical or fraternal. Dizygotic twins may share up to a five marker patterns but monozygotic twins will have the same pattern for all twelve. EasyDNA provides DNA zygosity testing and all TRA members get a special discounted rate.